I love my purple luggage set, but I hate the space it takes up when I'm not jet setting around the globe. Perhaps it's time to invest in one of Jen Groover's new travel cases! The designer responsible for the convenient compartmentalized Butler Bags has just launched a collapsible suitcase. As an entrepreneur, author, and motivational speaker, Groover is rarely in the same place for too long. 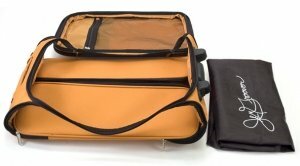 The frequent flyer created the Jen Groover Collapsible Pullman because she wanted a travel bag to fold flat underneath her bed. "I have an apartment in New York and space is at such a premium, and you end up shoving other things inside traditional luggage to store it in the closet," she explained. "I didn't think it was too much to ask to have luggage that folded flat." The wheeled trolley measures 20 by 15 by 8 inches, so it'll fit carry-on compartments and car trunks with ease. Classic travelers will enjoy the range of neutral shades, but I'm much more interested in the unexpected colors, including mustard, tomato, and mint green, not to mention the cute striped bags! The Jen Groover Collapsible Pullman is currently available for $82.50 through QVC, but it'll soon appear in travel stores and other accessory retailers.